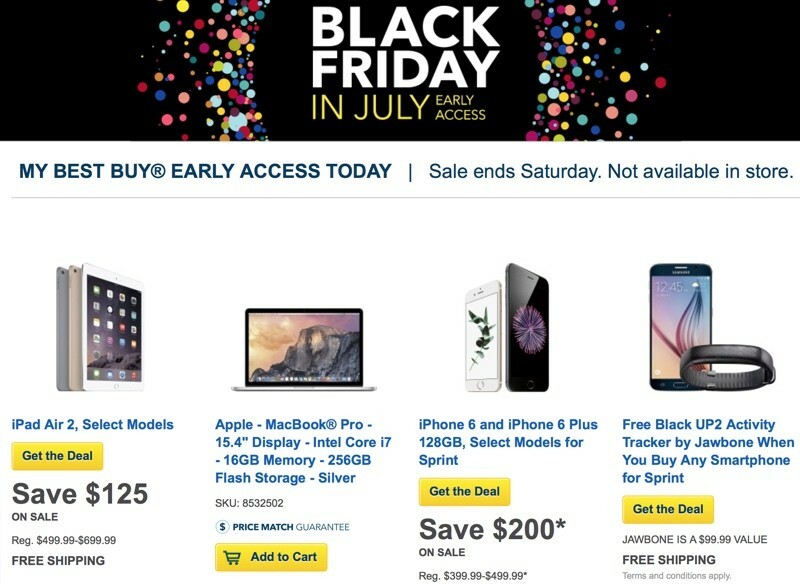 Best Buy is offering a "Black Friday in July" promotion this weekend, which will see the company offering significant discounts on many products. One of the major deals included in the promo is a price cut on iPads, dropping the price on the iPad Air 2 to the lowest we've seen since the tablet launched last October. Best Buy is discounting its lineup of Wi-Fi only iPad Air 2 models, dropping the price on the 16GB model from $499 to $374.99. The 64GB model is priced at $474.99 instead of $599, and the 128GB model is available for $574.99, down from $699. Discounts are available on all colors of the Wi-Fi iPad Air 2. Best Buy's Black Friday discount is scheduled to begin on July 24 and last through July 25, but customers who sign up for a Best Buy account can get early access to the deals beginning today. Signing up for an account is a free process, but does require a phone number and an email address. In addition to offering a discount on the iPad Air 2, Best Buy also has several other Apple-related deals worth checking out. The 2.2GHz 15-inch Retina MacBook Pro with 16GB of memory and a 256GB SSD is available for $1,749.99, a discount of $250. 128GB iPhone 6 and iPhone 6 Plus models from Sprint are available at a $100 discount with a two-year contract, dropping the price on the devices to $299.99 instead of $399.99. There's also a deal for a free Jawbone UP2 Activity Tracker with the purchase of any smartphone from Sprint. Unrelated to its Black Friday promo, Best Buy is also offering discounts on the 128GB Wi-Fi only iPad mini 3, dropping the price by $150 on both the Silver and Space Gray models. With the discount, the tablet is available for $449.99 instead of $599.99. These deals, particularly the discount on the iPad Air 2, are likely to go quickly, so MacRumors readers hoping to get an iPad at a discount might want to purchase today. Deals are online only today, but will be available in store on Friday and Saturday. Note: MacRumors is an affiliate partner with Best Buy. Is it just me or are these sales getting a little ridiculous. The gimmicky "Black Friday in July" is odd, but a discount is a discount. I currently only have the iPad 2 as my go to tablet and have been looking to upgrade for a bit now. This deal has me with my finger on the trigger. HOWEVER, after viewing the buying guide and seeing us so close to the end of the iPad cycle, I'm hesitant. What are the expert opinions, should I wait out, or do this great deal? Do you think they're running sales like these because they're trying to clear the iPad Air 2's out for new incoming models very soon? With a new iPad Air to be released in 3 months (based on previous releases), it doesn't make sense to get one now. An Air 2 is an exception... Only reason is due to the 2GB Ram, it's more of a future proof product. If there's a good deal on an Air 2 then I'd recommend it at this late in the cycle stage. Cool. I'll go do it tomorrow then. Thanks man. Would you say that the slightly less battery life trade off was worth it???? I bought my 16 GB iPad Air 2 at BB last week when they had a deal to trade in old iPad for gift card—I got $170 for my 16 GB iPad Air 1. On top of that I just got this deal price-matched at BB today. All in all I paid about $205 for an iPad Air 2 16 GB WiFi. Not a bad deal. Would say the iPad line has pretty much saturated. Not a lot of things Apple can add the the 3 to make it sell again especially since people don't upgrade iPads every year or two years like the iPhone. Maybe the iPad Pro but honestly it will probably cost more. Would say getting an ipad air 2 now for like $400 is probably one of the best tablets you can get and have it last for at least 4 years.